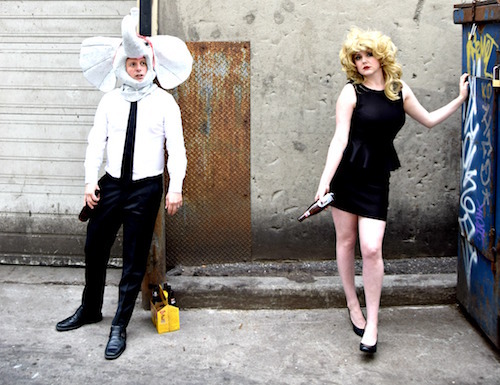 We’ll Be Better Tomorrow is a high octane, unabashedly hilarious sketch show with a powerful message produced by You Don’t Know Us, but we do know “us”, it’s Toronto’s Second City veterans Stacey McGunnigle and Jason DeRosse. It’s 10:00pm on the first day of Fringe and for some reason, I feel like I’m in the right place. The music I used to listen to in high school is on full blast (I forgot how good Ok Go was), the stage is set with the innards of a prop master’s chest and the audience is packed. Stacey McGunnigle and Jason DeRosse burst out at the top of the show to a Prozzak track wearing only their underwear. Okay…love it already. Over the next hour, we are taken through a series of insanely creative sketches that cover everything from skydiving induced breakups to a 13-year-old girl’s first period (the girl was played by Derosse in Paul Frank jam jams). Both McGunnigle and DeRosse are infallible when it comes to embodying and playing out their different characters. Some of my favourites were DeRosse’s white man-child, complaining to his boss about the woes of being priveliged like a toddler who just dropped his popsicle. I also loved McGunnigle’s impression of a ditsy sports bar waitress. That squeak in her voice was drop dead funny all on its own, never mind the hilarious lines that came out of her mouth. One thing that I think sets this show apart from your typical, run of the mill, pop-culture centric sketch show, is the high-level of originality in both the moment-to-moment dialogue and overall concept of the sketches. Most of the sketches involved scenarios that I’ve never seen referenced in a sketch show or even on TV, it was “real life” stuff that could only come from real-life experiences. Another great thing about We’ll Be Better Tomorrow is that not only do McGunnigle and DeRosse want you to be rolling on the floor by the end of the show, but they also want to teach you a lesson. That having (insert personal flaw here) isn’t weird! Now repeat it, louder…Having abnormally large feet for a woman isn’t weird! It actually makes you brave. Content Warnings: Mature language; Audience participation. Photo of Stacey McGunnigle and Jason DeRosse by Nigel Downer.